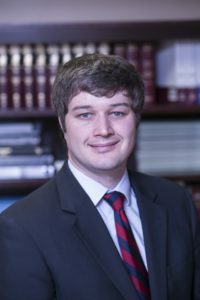 Chris Rowe joined Moore Ingram Johnson & Steele in 2015 as an associate attorney in the Brentwood office. His current areas of practice include Insurance Defense and Workers’ Compensation. Born in Nashville, Tennessee, Chris graduated from Wake Forest University with a Bachelor of Science in 2010. He moved to Knoxville to attend the University of Tennessee College of Law, where he graduated with his law degree in 2013. Following graduation, he was elected to the Order of the Coif by the Tennessee College of Law faculty. While in law school, Chris served as an Acquisitions Editor of the Tennessee Law Review, during which time he received the Silver Pen Award for Exemplary Case Note. Prior to joining Moore Ingram Johnson & Steele, Chris served as a judicial law clerk for Judge Thomas Brothers with the Davidson County Circuit Court and Justice Cornelia Clark of the Tennessee Supreme Court. Chris is admitted to the Tennessee Bar and is a member of the American Bar Association and Tennessee Bar Association. Chris lives in Franklin with his wife and son and enjoys spending time with his family, hiking, and watching University of Tennessee athletics.